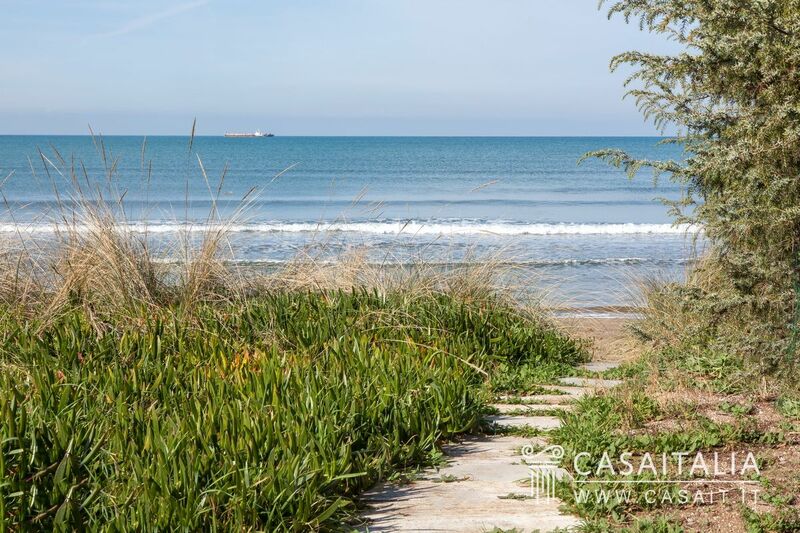 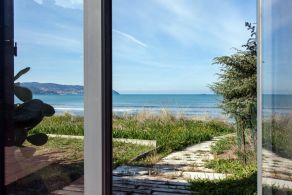 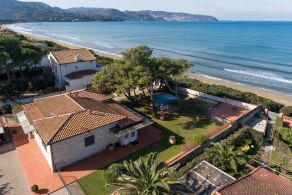 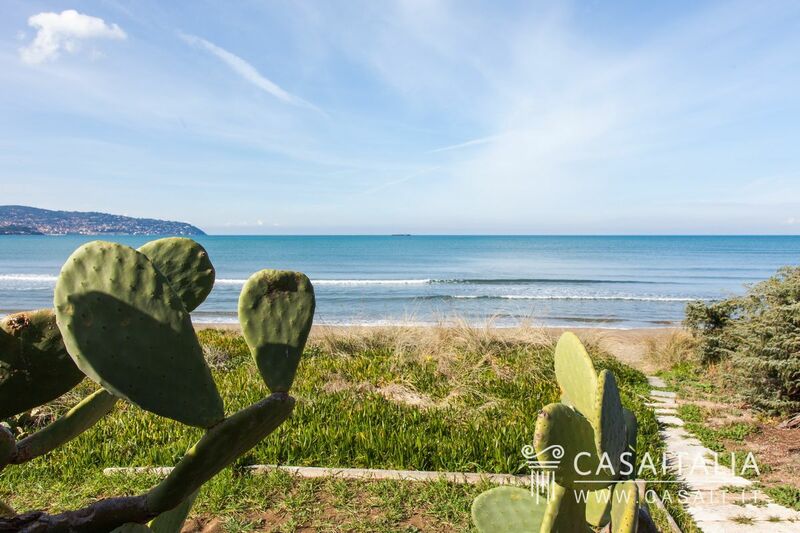 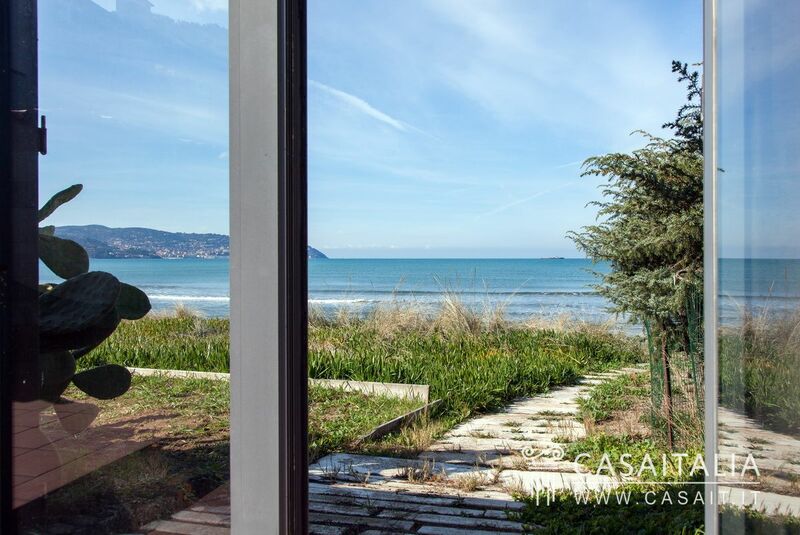 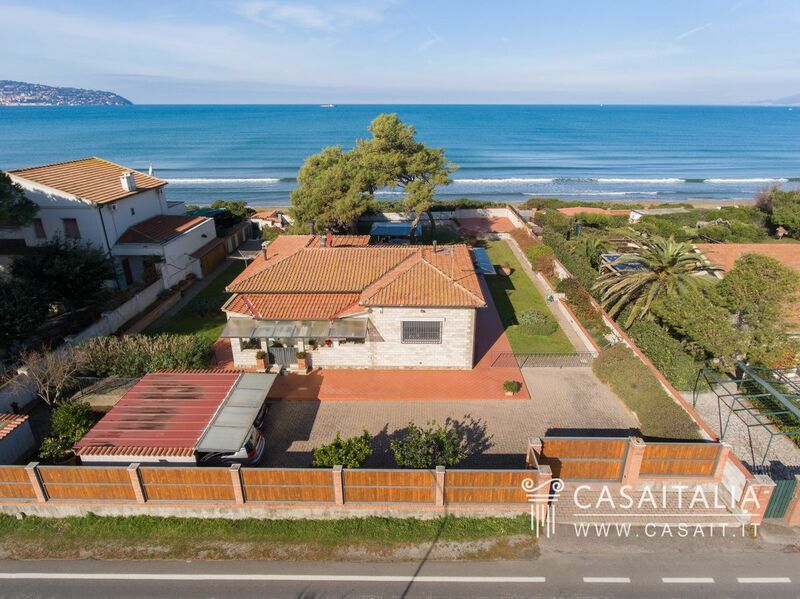 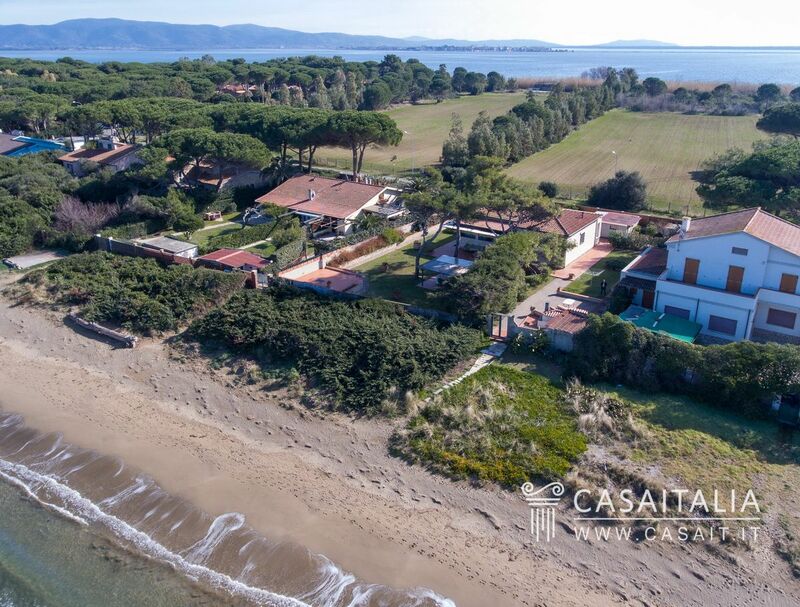 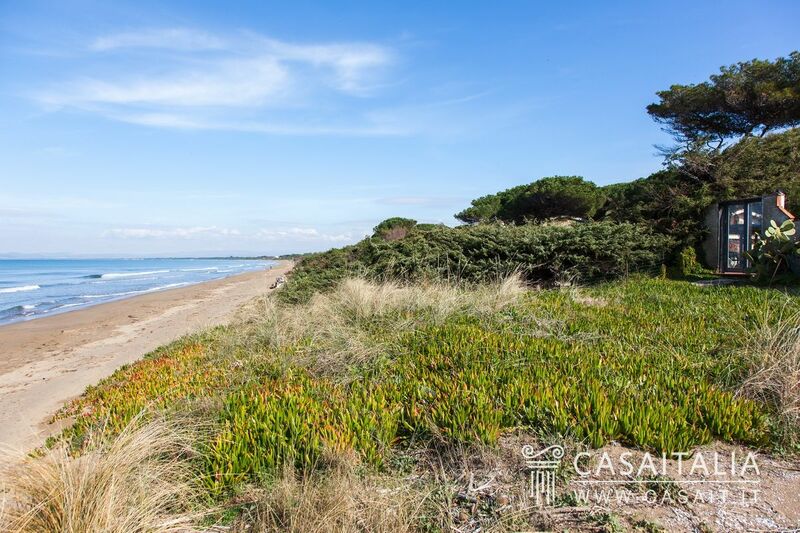 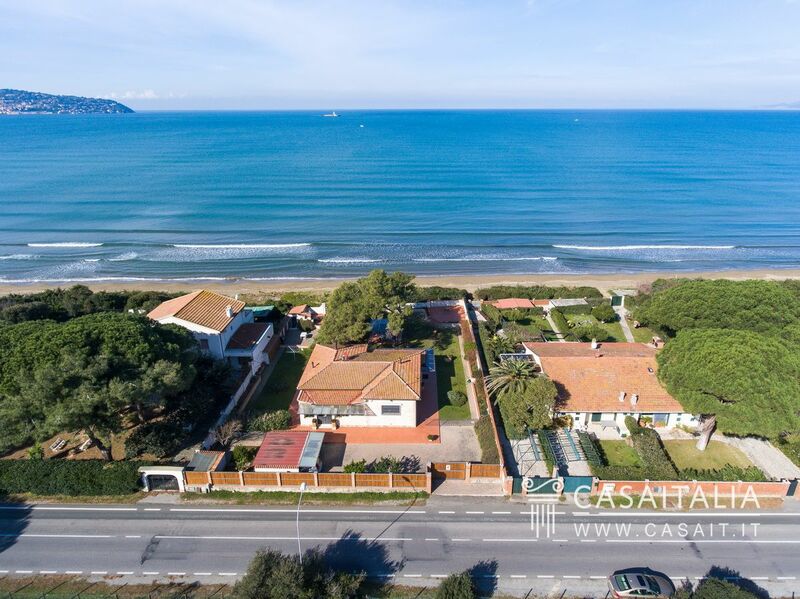 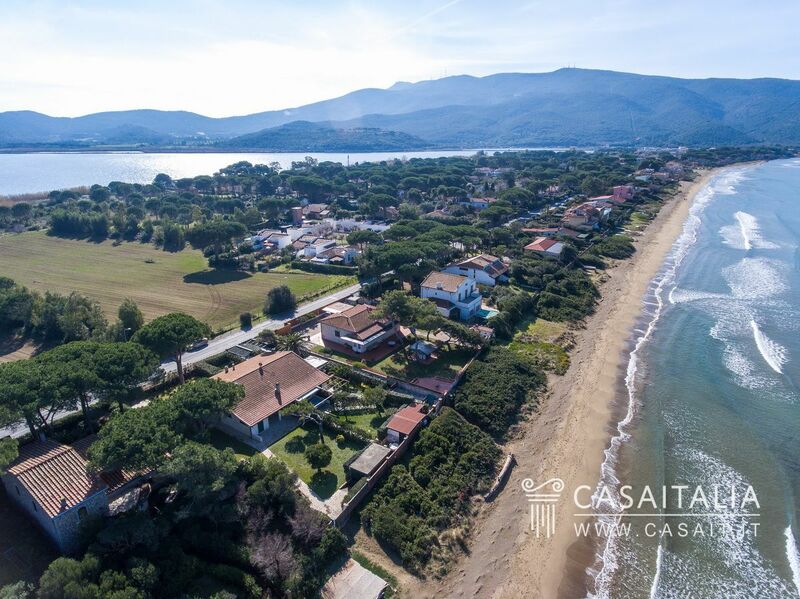 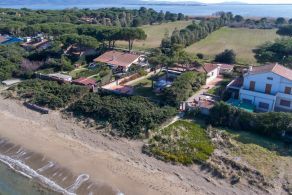 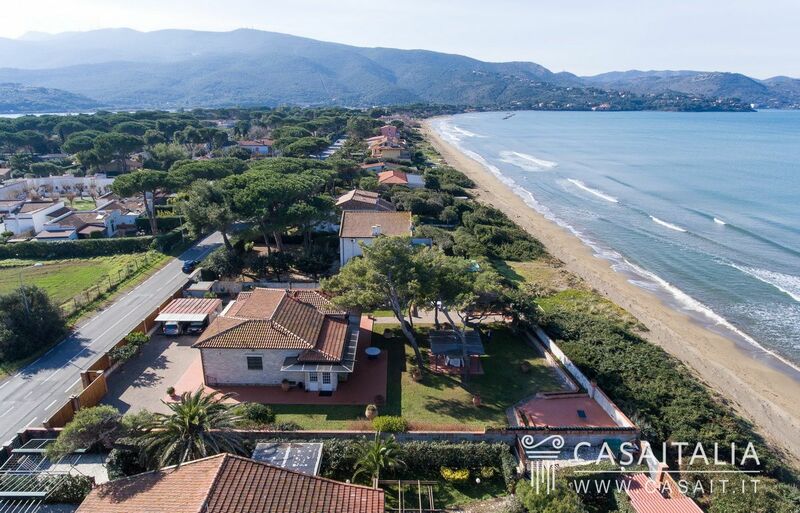 The villa for sale is in an incredible location: on a beautiful beach, ideal for sailing with a gently inclining shore and surrounded by over 1,200 sq.m of private garden. 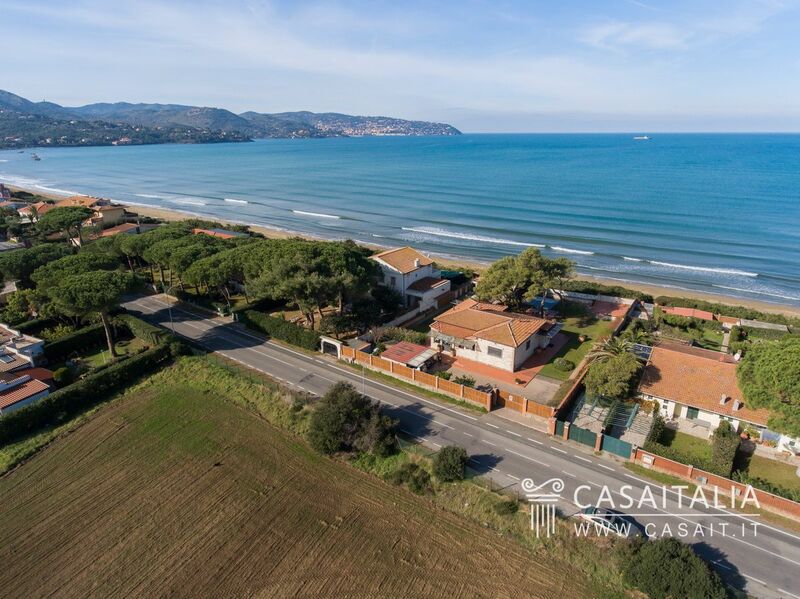 The closest populated area, the place to go for daily purchases, is just 1 km away, while Porto Santo Stefano (5 km) Orbetello (6,5 km), Albinia (8 km) and Porto Ercole (9 km) are all less than 10 minutes’ drive away. 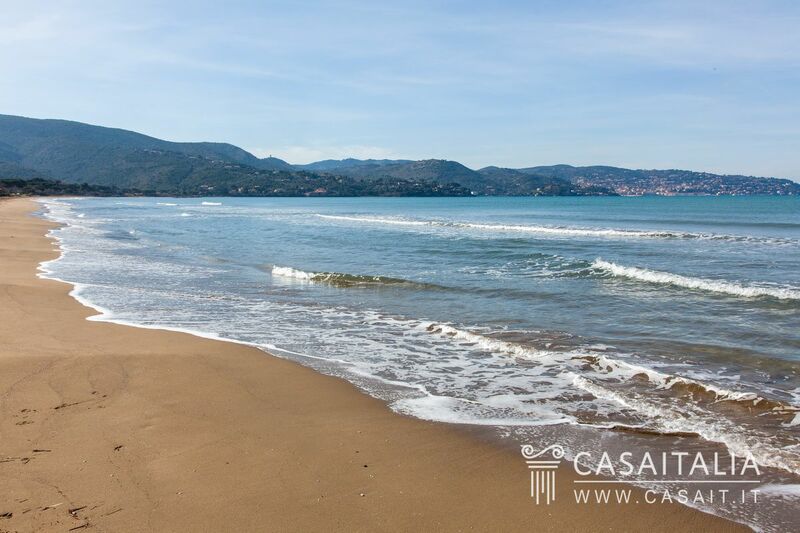 Monte Argentario is the name of the southern coast of Tuscany and is well known and loved for its famous seaside resorts (Orbetello, Albini, Talamone), its little villages (Porto Ercole e Porto Santo Stefano) and its stunning islands (Isola del Giglio e Giannutri). 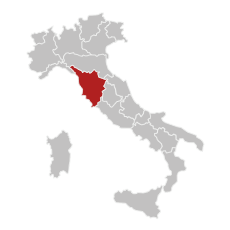 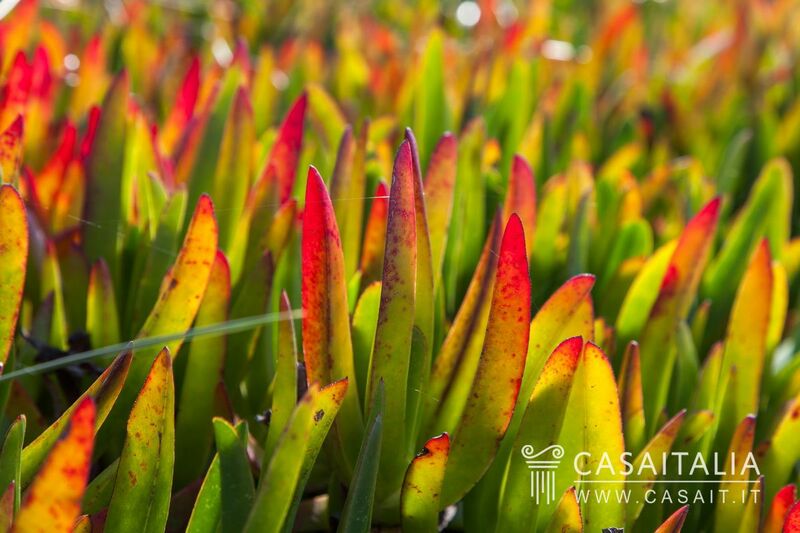 It is situated just 45 km from Grosseto, and can be reached in just 45 minutes and is less than two hours from Rome (160 km). 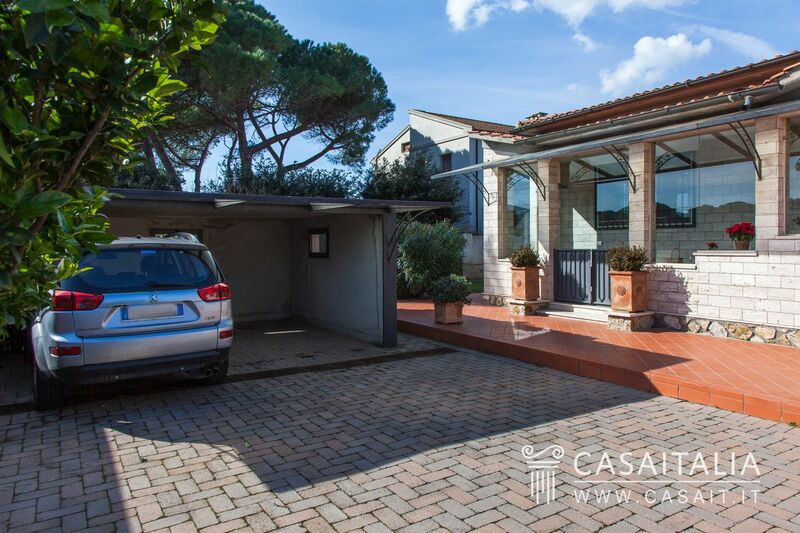 Rome Fiumicino (146 km), Rome Ciampino (166 km) and Florence (188 km) airports are around two hours away. 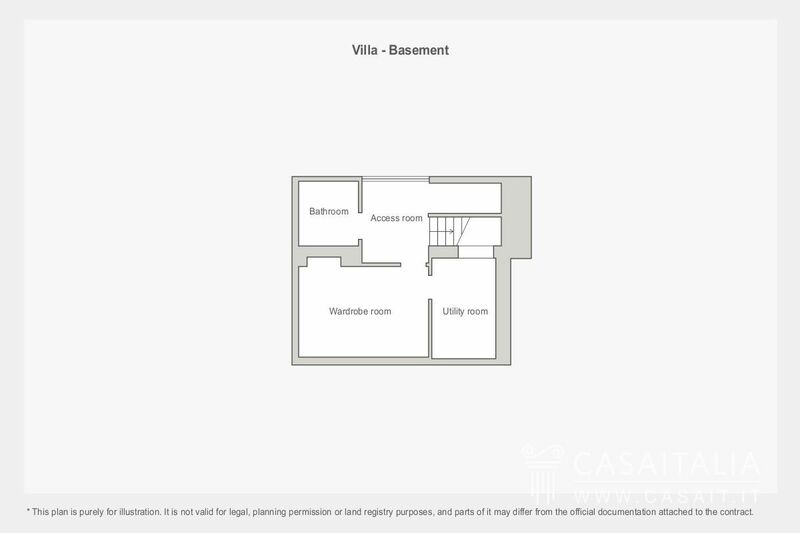 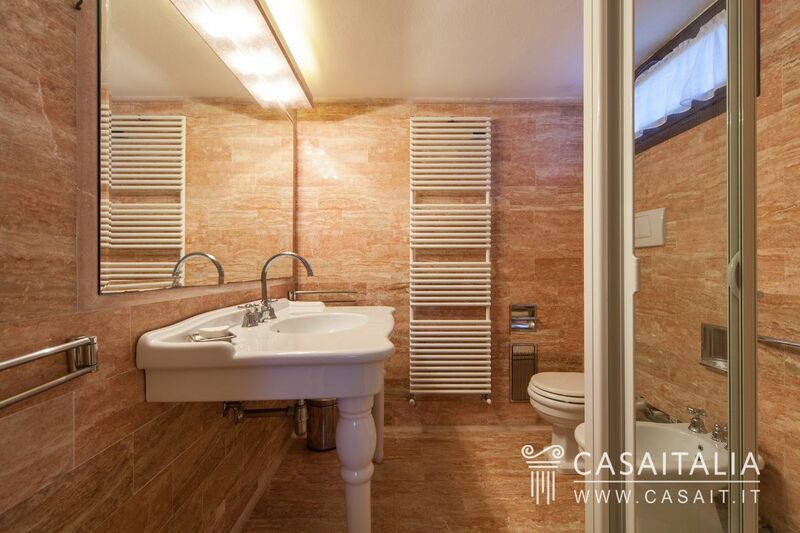 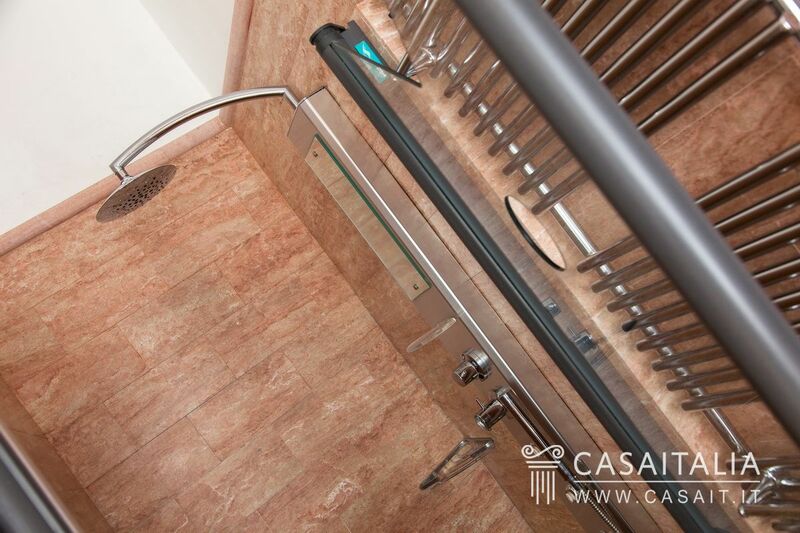 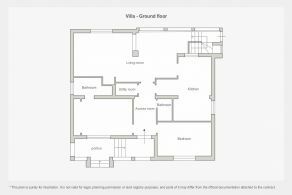 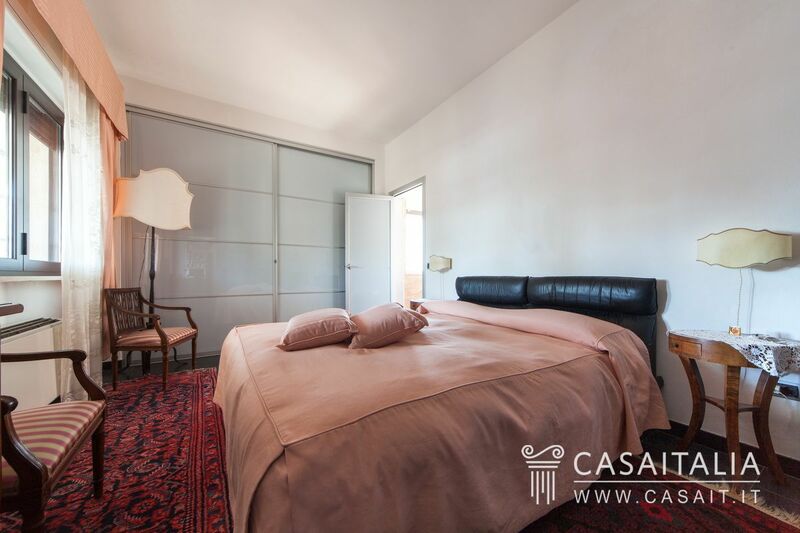 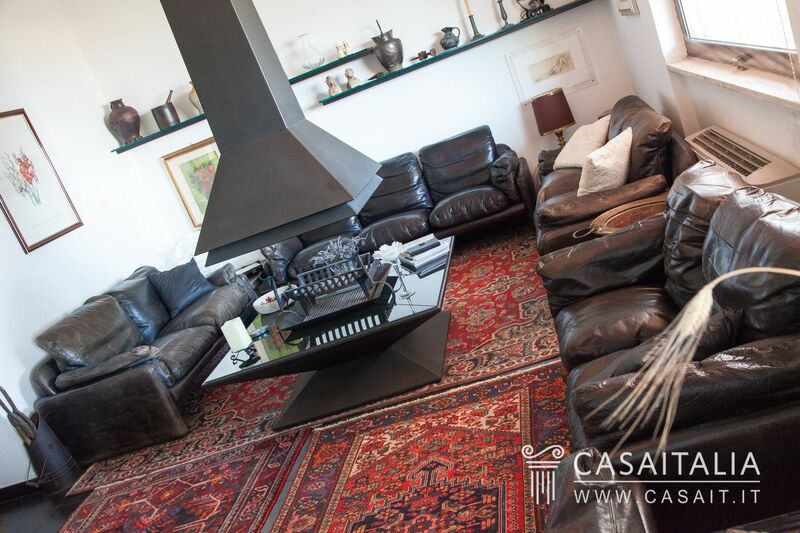 Villa Argentario has two floors, for a total surface area of 187 sq.m, of which 46 sq.m is basement. 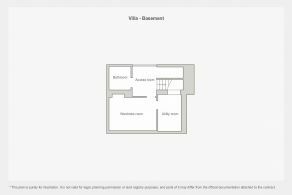 In the private garden, which measures over 1,200 sq.m, there is also a 23 sq.m garage, a utility area and a little storeroom. 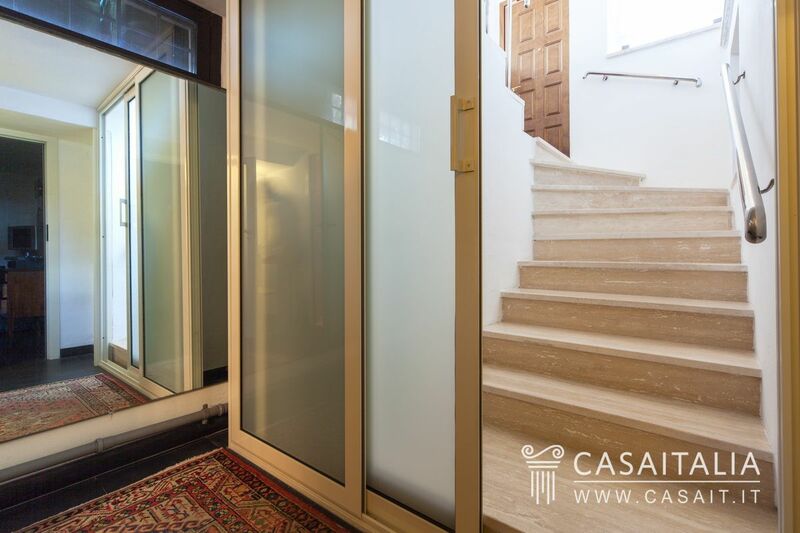 Access to the house is via a useful glass porch. 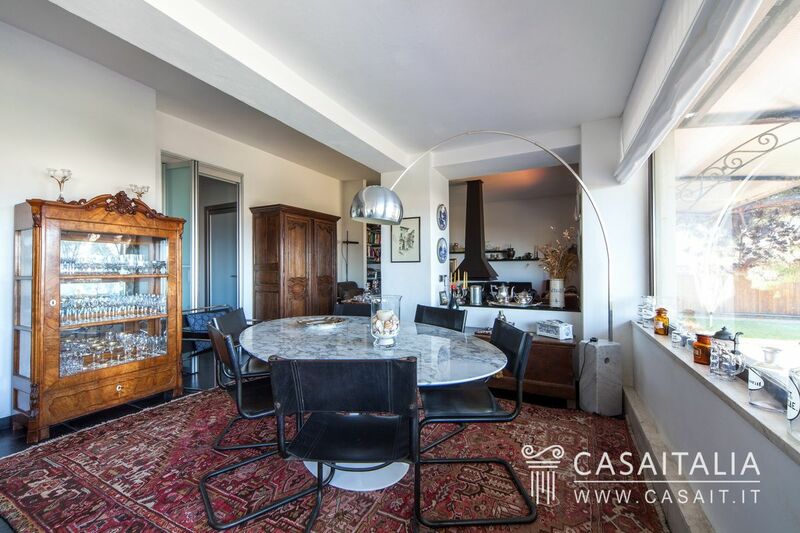 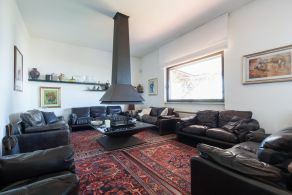 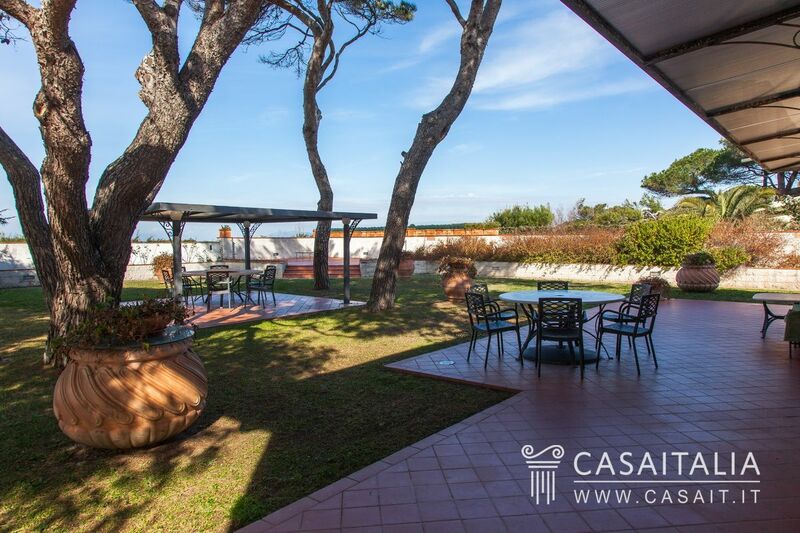 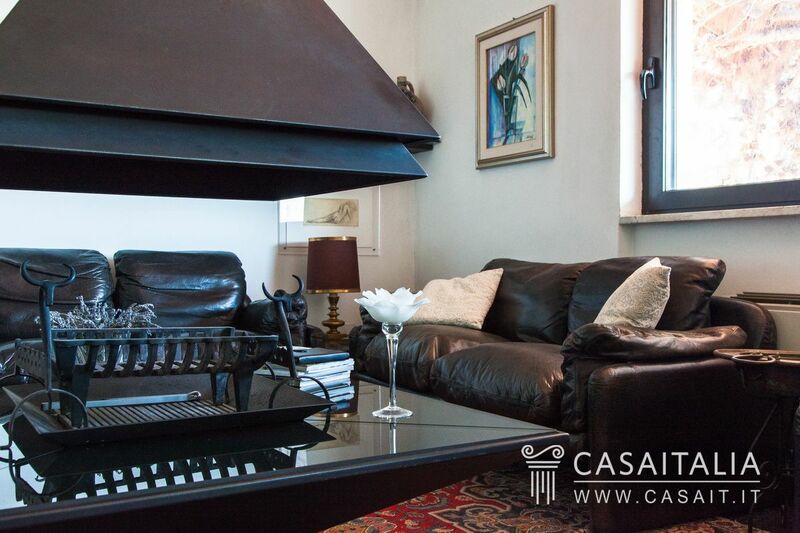 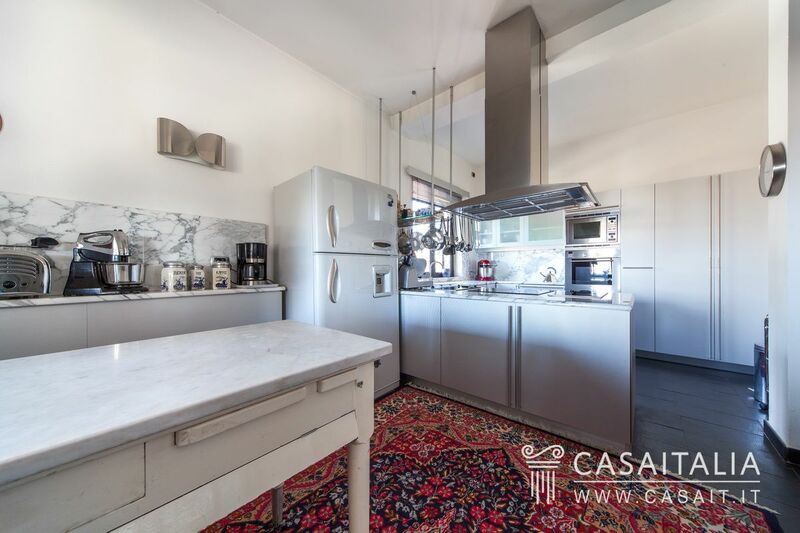 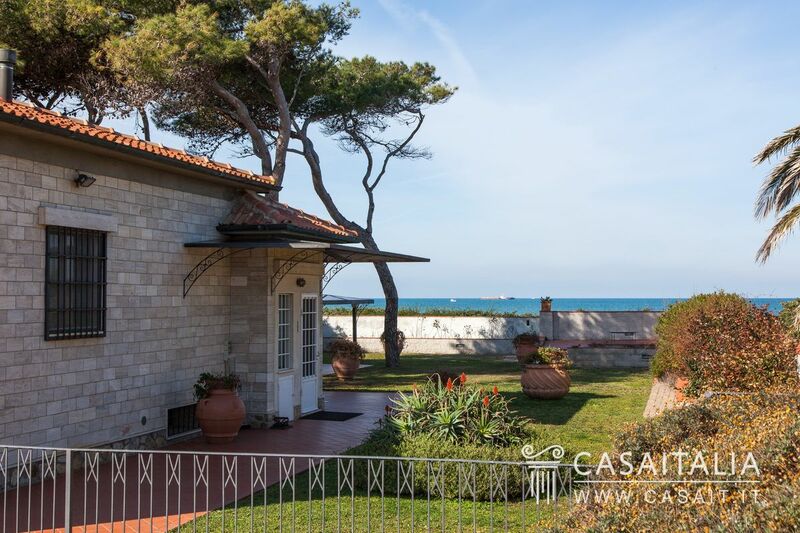 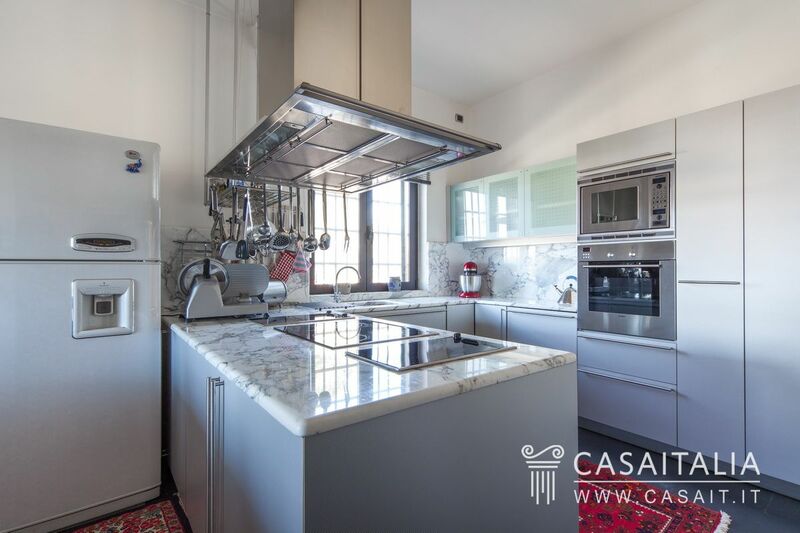 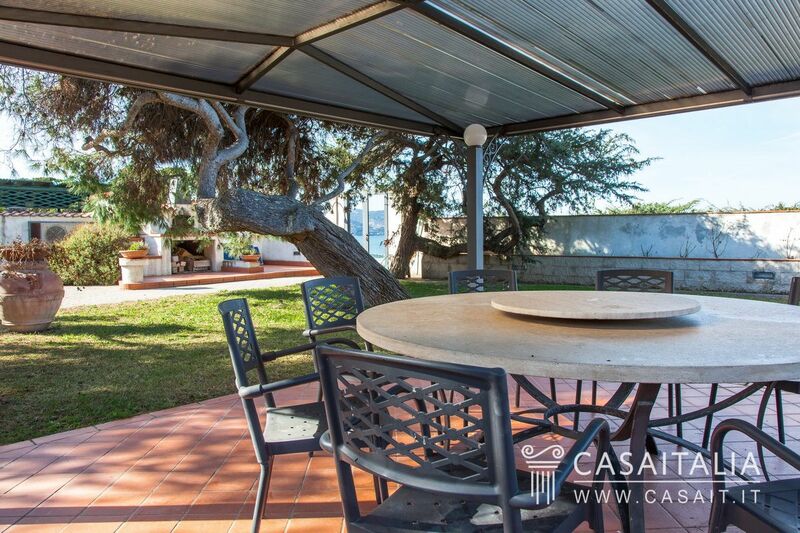 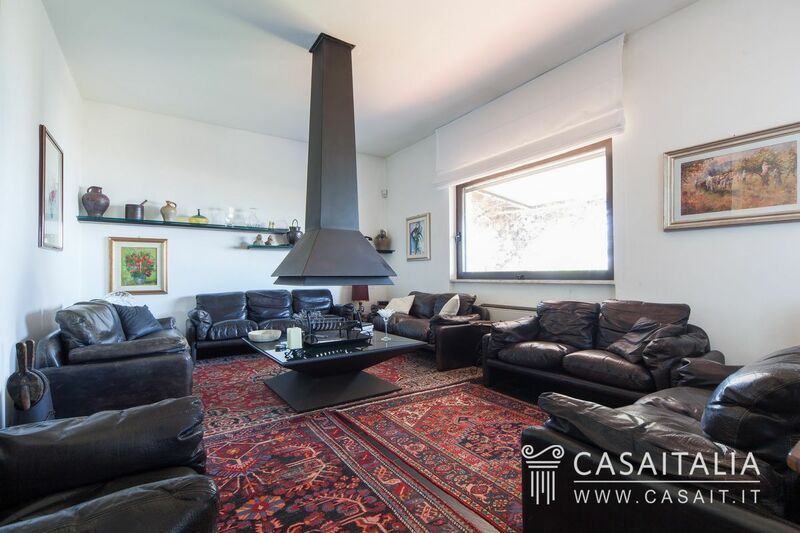 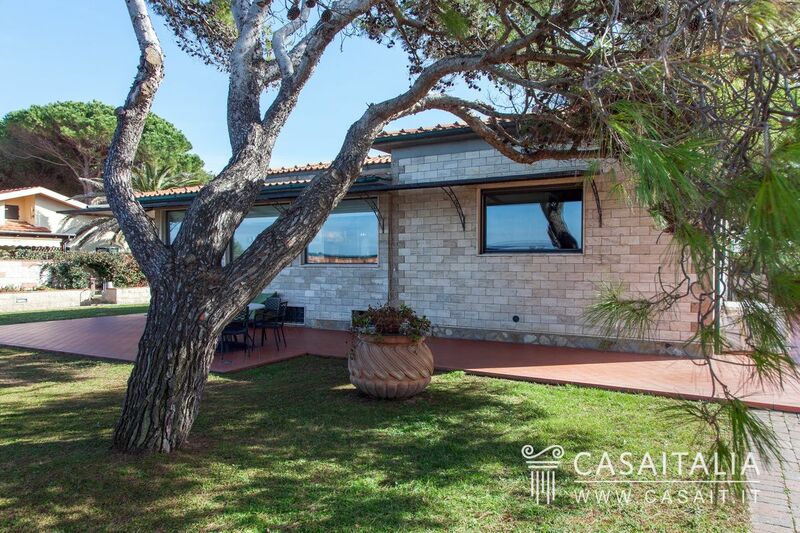 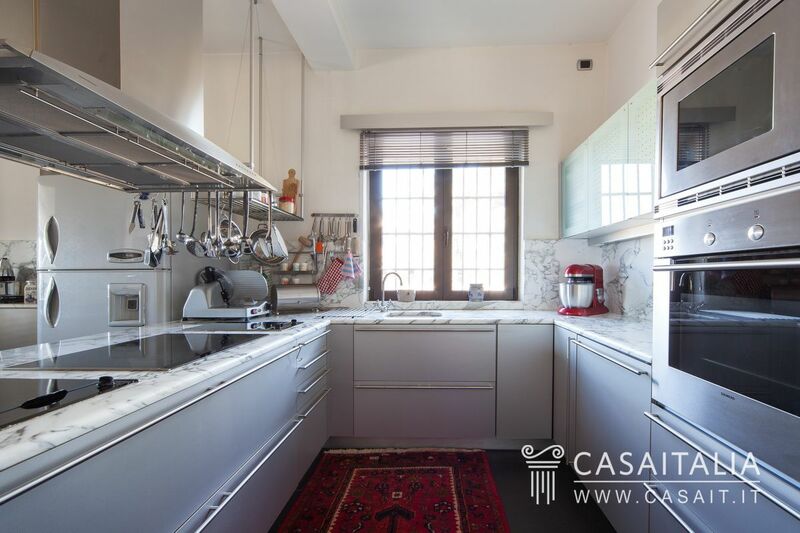 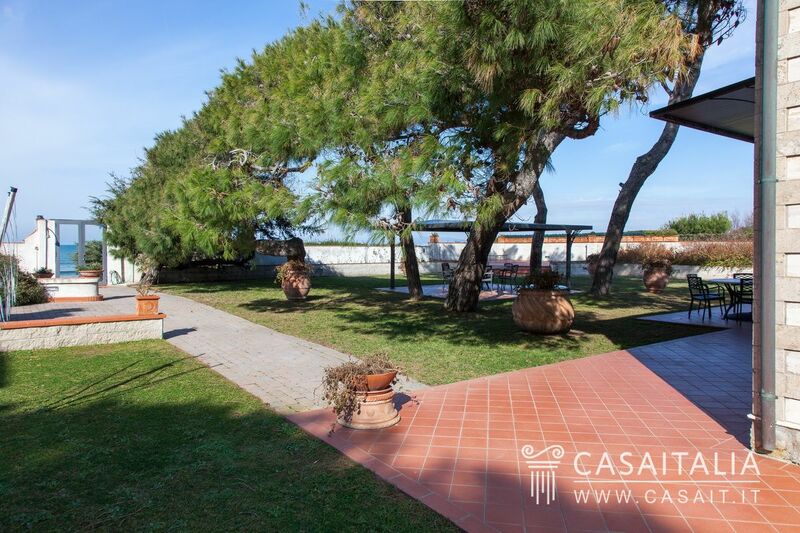 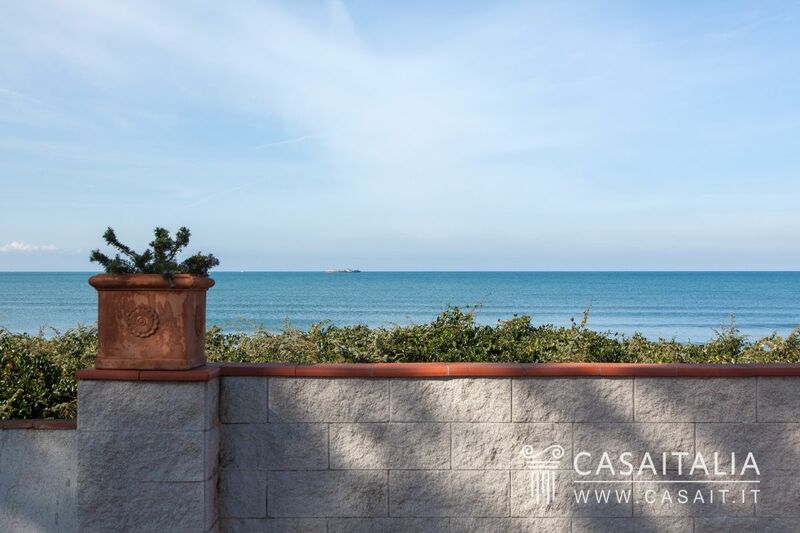 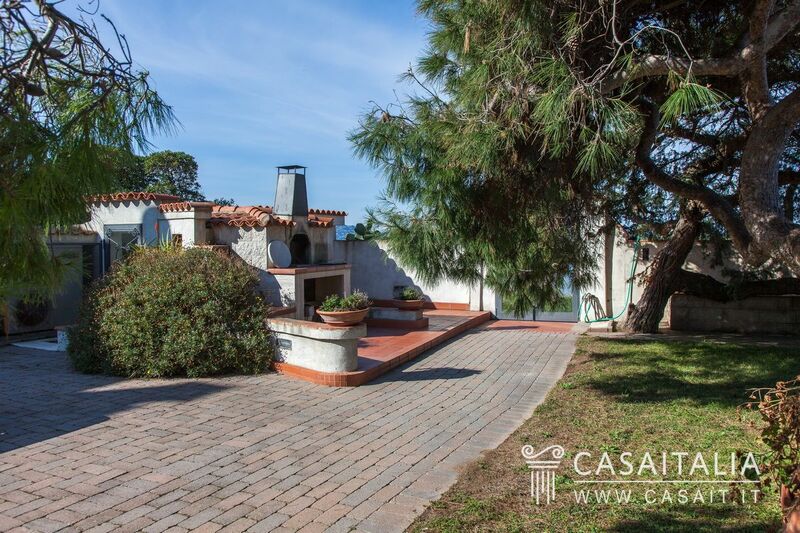 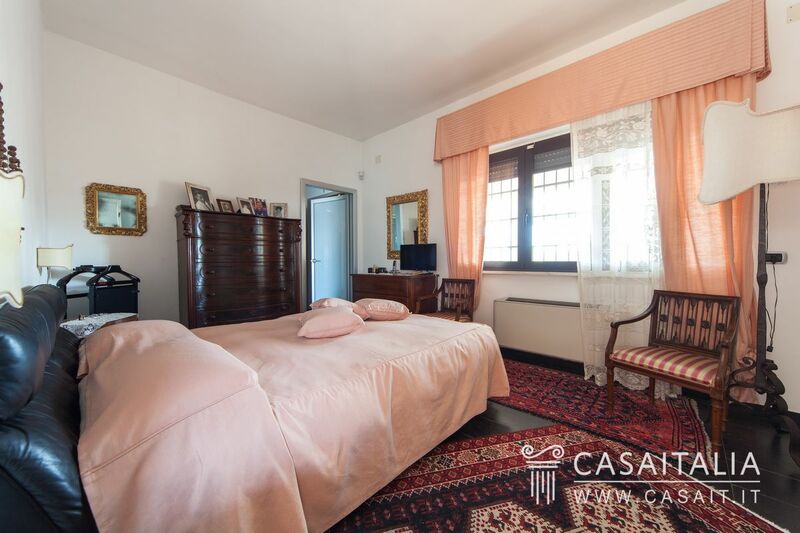 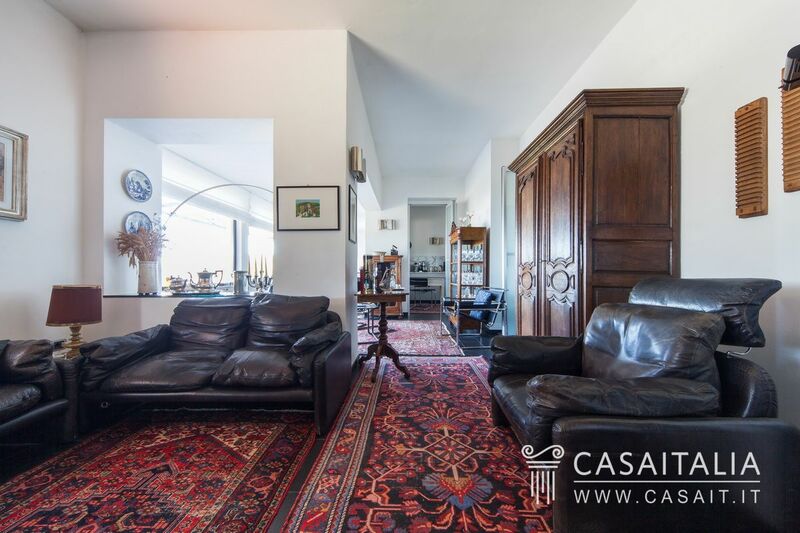 The villa comprises, on the ground floor, a large sitting room with decorative fireplace in the centre, dining area with access to the garden and sea view, kitchen with island, two bedrooms, two bathrooms and a storeroom. 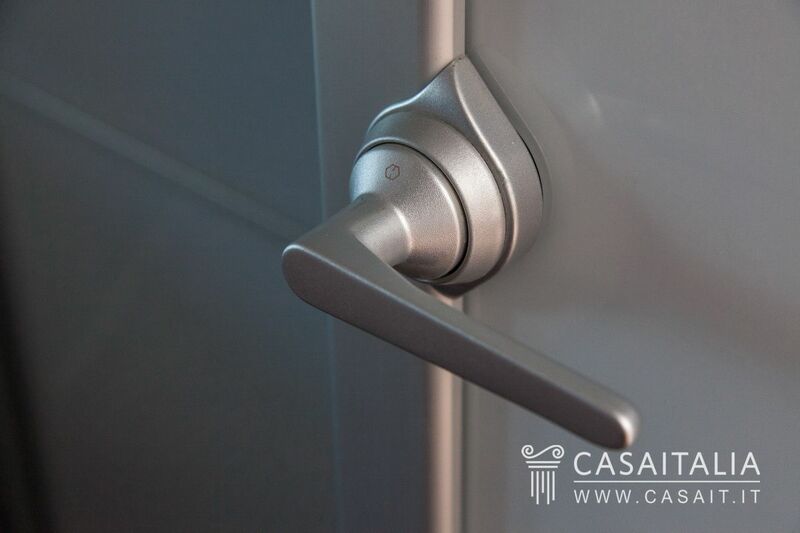 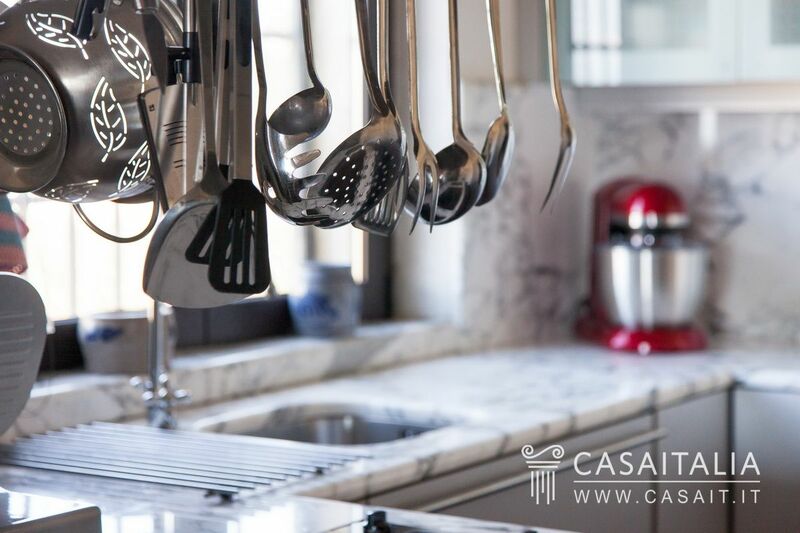 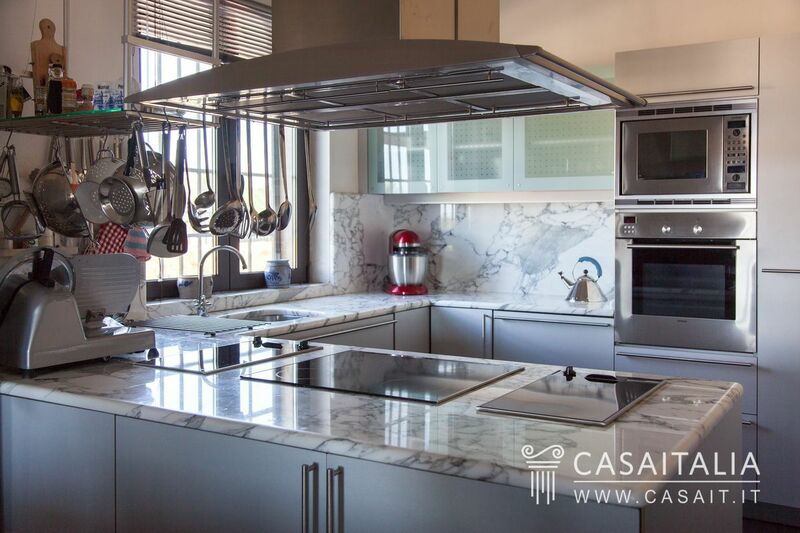 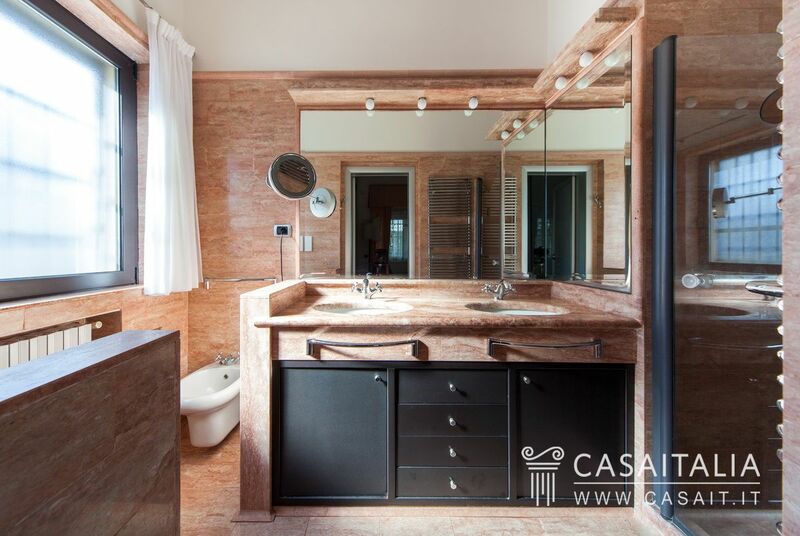 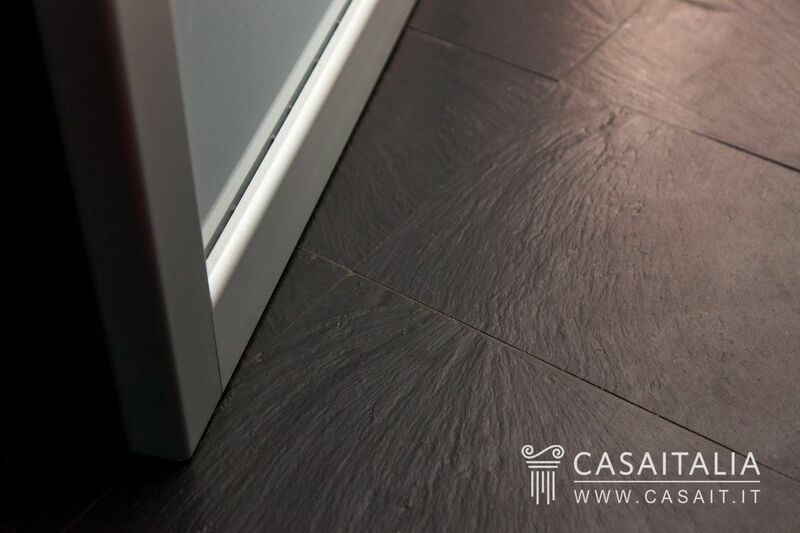 The villa has been restored inside and out, with high quality materials. 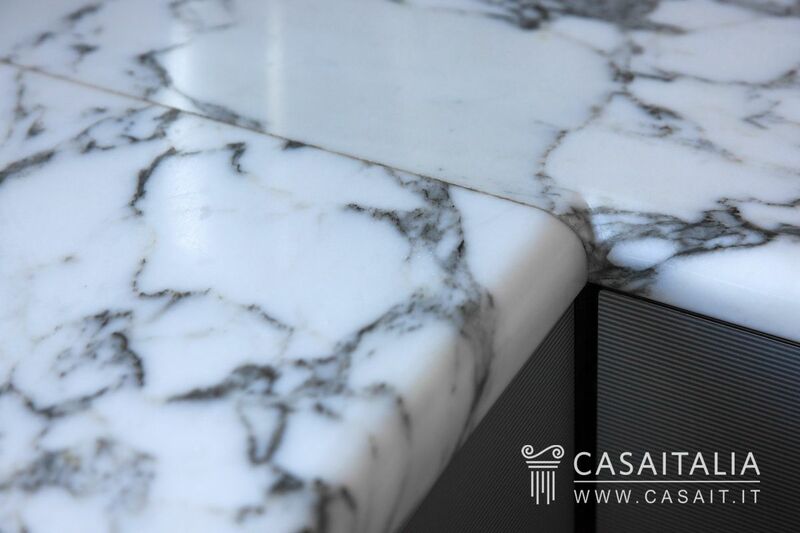 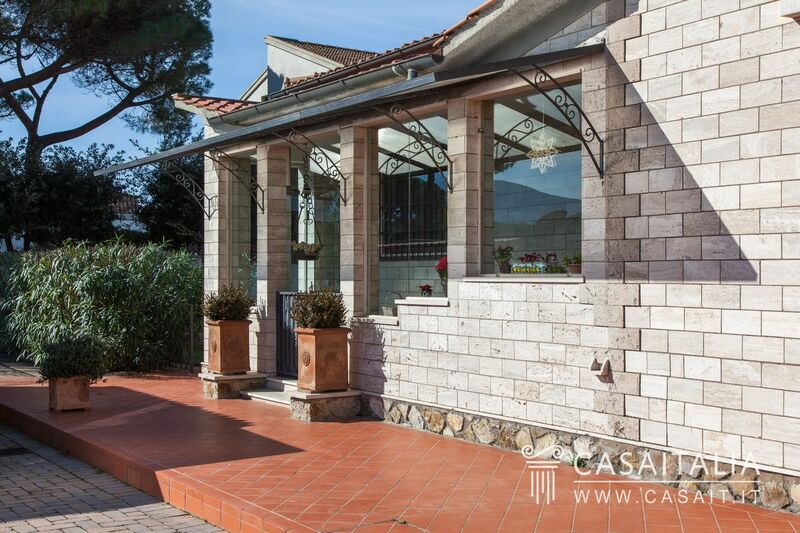 The whole of the outside of the building is covered in natural travertine while inside features modern finishings, with slate floors, Carrara marble worktops, Persian pink marble bathrooms, and fixtures in aluminium with double-glazing. 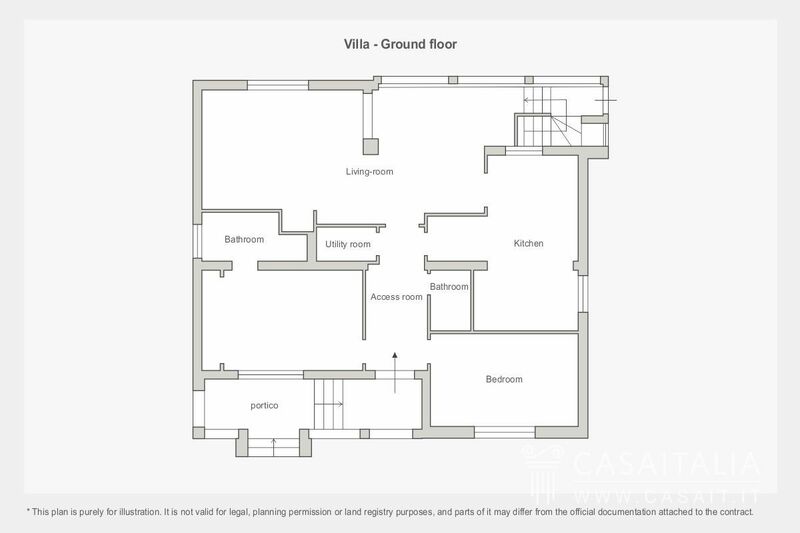 The property is completely fenced off, with vehicle access via an electronic gate and pedestrian access. 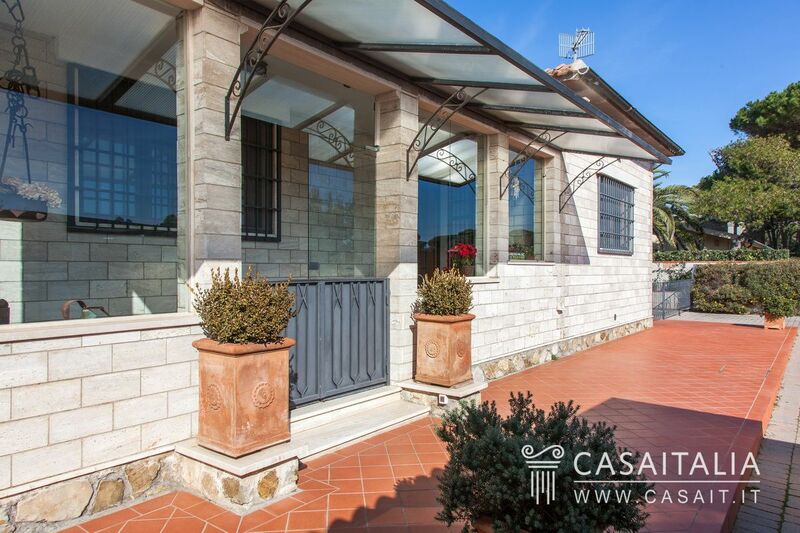 On the side facing the street, the fence features chestnut wood inserts. 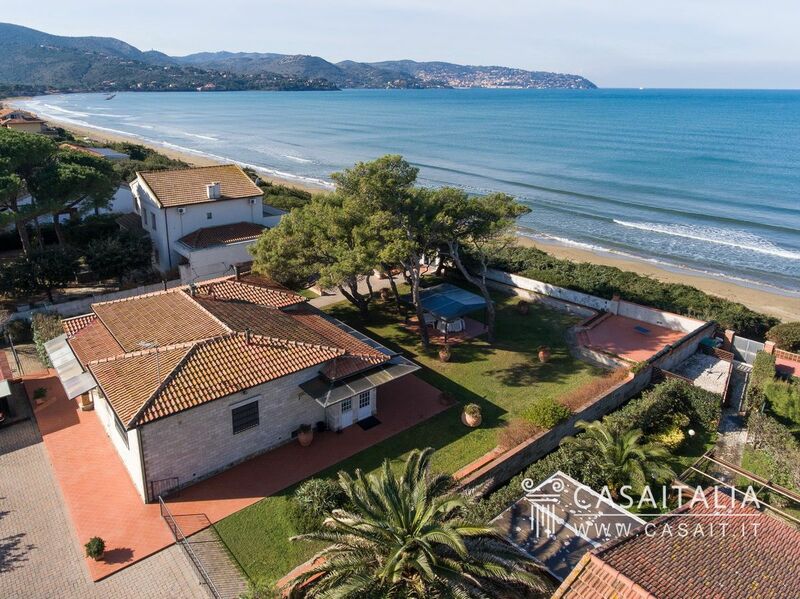 Villa Argentario is surrounded by 1,285 sq.m of private land (including the area around the building), some of which is used as a garden and some paved. From the garden there is direct access to the beach. 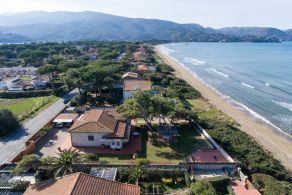 Thanks to its location, Villa Argentario is a property for use either as a main home or a holiday home, with the opportunity to rent it out during periods while not in use.